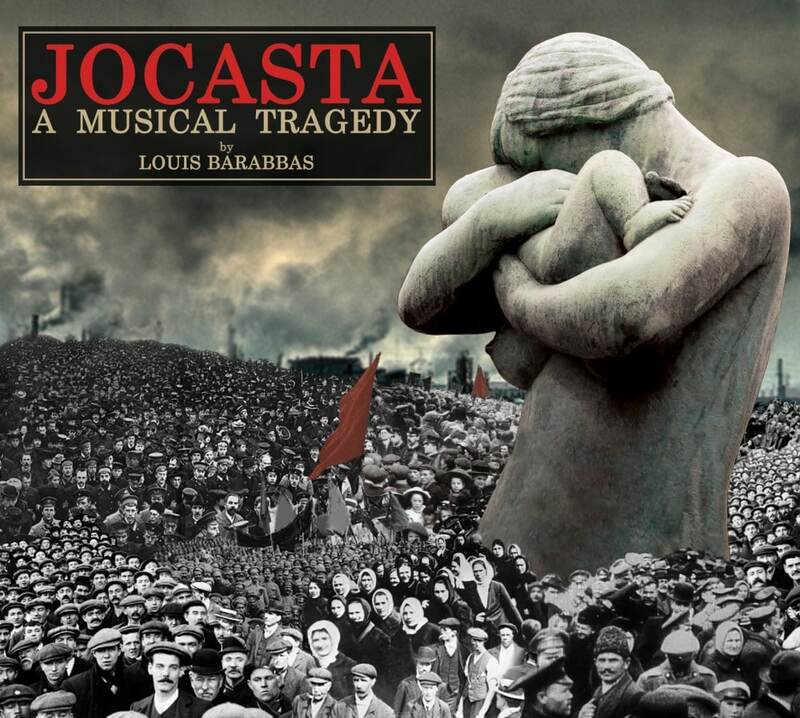 Jocasta is a double-album that forms the soundtrack to an ambitious musical project that Louis Barrabas undertook as his band The Bedlam Six said their final goodbyes and parted ways. It's been a few years in the making as you'd expect from such a complex undertaking, but the soundtrack is finally seeing the light of day in a complex challenging double album that requires the listener's attention throughout, yet rewards by being one of the few works of its type where the visual performance isn't necessary to fully understand what's going on. The context of the musical is this. It stems from Louis's obsession with tragedy; a theme often explored inhere and now living social and personal terms in The Bedlam Six's work, yet here he seeks to put a more modern twist on the Greek mythology tale of Oedipus and to try and spin the story to be seen from the viewpoint of the mother. For those with little knowledge of Greek mythology, in brief, Oedipus was abandoned as a child and raised by another family. An oracle prophesized that he would end up killing his father and marrying his mother, so he left them and on his travels ended up killing a stranger who happened to be his father. He lifted a curse on the city by defeating a sphinx and ended up marrying the widow of the city's dead king, who happened to be his mother and the husband of the stranger he had killed (his father). On finding out the truth, his mother hanged herself and Oedipus poked both his eyes out. As you can imagine this isn't the material most albums or musicals are made of. To enact the story, Louis has recruited a series of collaborators to tell the tale including Bridie Jackson, Ríoghnach Connolly, Felix Hagan, Liz Green, Tom Hingley, Tom Robinson, Jami Reid-Quarrell and Natasha Hodgson across the musical's two discs and thirty one tracks. It's a challenging listen as you can imagine to keep up with the story that's being told and the bringing up to date of some of the themes that Louis has attempted throughout. Like The Bedlam Six and his best solo work, there's an emphatic drama to the songs that feel just right for the context of a musical from the wandering opening of Overture where you can imagine a scene being set for the rest of the piece in front of you. Bridie Jackson takes the role of Jocasta whilst Louis takes the role of Robert Croen and they are the two key characters and it's Bridie that sets the scene of the futility of individuals fighting against the system on their own in Welcome To The Upside Down and Every Tragedy Begins With A Happy Ending where the two songs talk of "Some towns chew you up, this one digests you slow" and "We've got the perfect view to watch our shrinking futures." Hate is equally as relevant today as it is at the time the story is set, talking of the media-fueled hate of anyone who dares to be different to what is seen the norm. It's a bitter, bile-filled but entirely spot-on assessment ("fear is unconverted hate") of society that talks of the groups so vilified by the likes of The Sun and The Mail these days, whilst the urgent A Good Day To Bury Bad News, where his character is lost as a baby in the story, is equally a stream of conscious social commentary as it is a point where the narrative of the musical is being fleshed out and other characters come in the chorus as brass kicks in. The story continues through a number of characters telling their part in the story set to music. Whilst at points it might be hard to follow without the benefit of visuals and having read a book of the story, the songs do fit together as the tale develops, often being told in the first person as when Jocasta's husband and Caliper's father mulls over his position as the leader of the city. It's hard listening as you can't switch of for thirty seconds, but it's a rewarding sacrifice to make. There's a real diversity to the music throughout, one minute it's a piano ballad with a dramatic music hall French-accented vocal on Where Is The Romance?, the next a hit and run dueling male and female duet that doubles as a conversation on How Do You Know? to songs like the bar room tale of Same Again and the contemplative lonely reflection of No Baby To Lull where Jocasta looks back to her lost son and that switching between styles runs throughout so that each song feels a distance from the one before, in structure, style, participants and what tale it's trying to impart. It's here that Jocasta demands your attention, it's far from your traditional album in the fact that it's a soundtrack, but it's even further away as the only consistent theme is the story. There's a lot of parallels that have developed during the time Louis spent writing the musical with what's going on today in the world, the way media and politicians are in it together (Pulling The Strings could be sung by Murdoch) and twist the world to suit their agendas - and most importantly a sense of hope that things will eventually change (If That's What You Call Progress is a particularly succinct assessment that there must be a different way) if the people get together, get organised and stand up to and fight against those that seek to control them although it's the next generation where it takes hold and has an impact. Jocasta is an impressively intense piece of work that could quite easily end up being a self-indulgence that loses its impact, but the clever use of a wide range of characters and musical styles keeps the listener intrigued even without the help of visuals and, whether intentional or not, it also delivers a social commentary that feels absolutely relevant in these post-Brexit media controlled days that we're living in. Louis Barabbas can be found on Facebook and Twitter. Jocasta is available on double CD or download from Louis' Bandcamp.